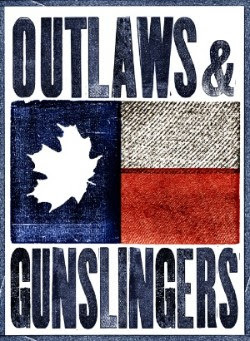 OUTLAWS & GUNSLINGERS RETURNS TO JUNOFEST IN VANCOUVER. We really know how to JUNO right, if we do say so ourselves, so come party with us. We’re especially pumped to be heading to lovely Vancouver, BC for JUNO weekend because we are once again co-presenting the annual banger, Outlaws & Gunslingers, with our cohorts at Starfish Entertainment. The party will be Friday, March 23 at the Imperial with stellar artists such as Jim Cuddy, Terra Lightfoot, The Jerry Cans, Rose Cousins, Harrow Fair, and tons of others including our very own Ensign Broderick, NQ Arbuckle, and Whitehorse. Our BFF for life, the very talented Ford Pier, will be the musical director for this crazy evening. He has put together a hella tight band that includes Vancouver’s finest: Ryan Peters, Keith Rose, and Paul Rigby. I wonder if Keith Rose and Rose Cousins are actually rose cousins? Get yourself a JUNOFest wristband and show up on time to find out! Doors at 8, show at 9, party all night loooong. https://sixshooterrecords.com/2011/wp-content/uploads/2017/11/17-ssr-logo-home.png 0 0 Sarah https://sixshooterrecords.com/2011/wp-content/uploads/2017/11/17-ssr-logo-home.png Sarah2018-03-02 21:22:032018-03-05 21:22:18OUTLAWS & GUNSLINGERS RETURNS TO JUNOFEST IN VANCOUVER. INTERSTELLAR RODEO LINEUP ANNOUNCEMENT HAPPENING TUESDAY, MARCH 6. COME PARTY WITH US AT SXSW.